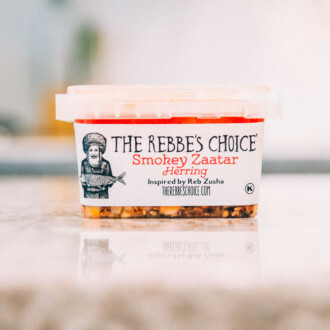 This sharp and fiery herring is inspired by the chassidus of Kotzk (Kuh-ts-k). Kotzk, a small town in Poland just out of Lublin was the home of Rabbi Menachem Mendel Morgenstern (1787 – 1859), the first Rebbe of Kotzk. From his earliest days Reb Menachem Mendel had been very outspoken on the matter of truth. He never refrained from calling people out on their falsehood. The Kotzker, as he is called, said of a particular group of his Chasidim, “They walk around with the worst of thoughts and try to cover it up with a few pages of Talmud.” In Kotzk, only the truth would flourish. Falsehood, pride, money, were worthless in the Fiery enclave of Kotzk. The Kotzker, unlike the rest of the world, did not fear the truth. He was born in the small town of Goraj, Poland. Where even at a young age he become renown for his scholarship and sharp wit. Soon enough he moved on to Lublin to meet the great Chozeh of Lublin, the Seer of Lublin. The Chozeh introduced him to the world of Chassidus, and from there Reb Menachem Mendel became a student of “The Holy Jew – The Yid HaKadosh”. Under the Yid’s watch Reb Menachem reached the higher heights of human perfection, uncovering and remedying even the smallest of faults in his character and service to God. The fault that can be found in any person, that of falsehood, was the greatest focus of the Rebbe of Kotzk, and even though he was know expressly for his devotion to the utmost truth, he constantly worked to improve himself in the aspect of truth regardless. The Kotzkers son in law, Rav Avraham Borenstein of Sochatchov (Suh-ch-atch-ov) said of his holy father in law, “In the days of the Yid Hakadosh they began to teach the path of truth. 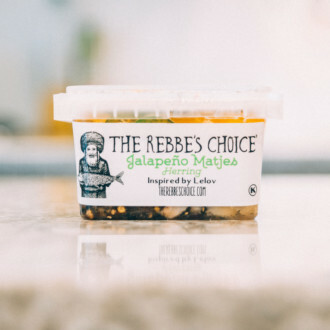 But in Kotzk they took the path of truth and expanded it into a highway…” The fiery truth and sharp wit of the rebbe of Kotzk is imparted into the sharp kick and fiery spice of this delicious herring. The mantle of leadership was passed from Reb Menachem Mendel to The first Rebbe of Ger, The Chiddushei HaRim, Reb Yitzchak Meir Alter. Rashi and the Gemara in Mesechta Sotah (12b) tells us that the Hebrew word for maidservant, Amassah (אמתה) can also be read as ‘Her hand’. Thus the Pasuk now reads as ‘The daughter of Paraoh sent her hand.’ This is where we get the classic story that the hand of Paraohs daughter stretched beyond human capability in order to reach the basket of Moshe. After Avraham buries Sarah he makes it his goal to marry off his son, Yitzchak. So he sends Eliezer to be the Shadchan and the Torah relates this to us in great detail. And we can’t help but wonder why the Torah devotes so much space to the details of Eliezers quest; how many camels he took, what kind of gifts he brought… And then the Torah repeats the whole story about how he decided Rivkah to be for Yitzchak by her willingness to give the camels to drink. And another question, why would finding a match for Yitzchak be such a challenge in the first place? We know from the Ramban that Avraham was considered a king and that he was rich and famous, so why would it be hard for him to find Yitzchak a wife? If anything the Girls should be “lining up” for the chance. To answer these questions we can look at something famous the Arizal has written: The highest souls sent down to this world are displayed in the lowest of places. The natural way of our Olam, our world, is to conceal HaShem. Because of this, the highest souls, those which are capable of revealing the greatest light into the world are placed where there is the most darkness. As the Kotzker says, the most beautiful diamonds are found buried the deepest underground. And in this Parsha we see Evidence of the Arizals dictum, for Rivkah was entangled in the deep spiritual black hole that was her fathers house. So Avraham understood the Arizals concept, he knew the spiritual ins and outs of our world and he knew that the holiest soul that would be fit for his son would be buried in a deep darkness completely devoid of holiness, therefore Avraham saw it would be difficult for him to find a soulmate for Yitzchak so he had to create a whole mission to accomplish this, in order to rescue this pure diamond from the filth that surrounds it. And since the initiative to find Yitzchak a wife was from Avraham and not Yitzchak the whole journey was done with Chesed, for Avraham is the highest personification of HaShems Chesed in this world and therefore Eliezer was too, for we learn that a persons messenger is like the person himself. And if Yitzchak, who is the opposite of Chesed, Gevurah – constriction and judgement, were to have initiated the Mission for a wife the whole process would have been done with Gevurah and he never would have found a wife because in order to lift up a soul from darkness to light one needs to be coming forward with Chesed, not judgement. This is why Eliezer said “the first girl to who I say…” The first girl?! The first one that would pour water for him and his camels would be Yitzchaks wife?! That could’ve been just about anyone! How could he have made such a condition? For when a person connects to someone with Chesed, Chesed is returned, just as Eliezer acting in Chesed asked Rivkah to pour she returned the Chesed and this is how he knew she was ‘the one’. If this journey were conducted with Gevurah this whole thing would never have happened, Eliezer would be too picky, but since Avraham initiated this assignment it was carried out with utmost Chesed and because of that Eliezer was successful for he was coming as Avraham, and he was able find that diamond in the rough – to uplift it, and bring her to Yitzchak. Rav Levi pondered for a moment and said, “Wait here.” He went into his private room, and came out a few minutes later holding a blank piece of paper. “Here’s your passport,” he said, giving the paper to the chasid. Then, seeing the expression on his student’s face, he added, “Don’t worry. With this passport you won’t need anything more. The only thing you need other than this is trust in HaShem.” He ran home, packed his things, and set off for Lublin. When he came to the Polish border, he took a deep breath, said a silent prayer, and handed the soldier the Berditchever’s passport. The officer studied the blank paper for a moment, and then started saluting the chasid: “What a privilege – to meet such an exalted person. It’s the greatest honor of my whole life! On behalf of the Polish government, I’d like to offer you whatever help I can on your journey. Perhaps a horse and carriage would make your travels more comfortable?” This chasid, a poor man, had never ridden in a carriage in his whole life! Wherever he went in Poland, he showed the Berditchever passport, and all the gates were instantly opened. He was treated like a king. His trip was a breeze, and he returned home B’Shalom, in peace. Many years later, in 1935, a Munkatcher chasid, a Yid with long peyos and a thick beard, was also in trouble. He had to go to Germany right away to handle some things. He had a passport, but with the Nazis already in power, he knew an ordinary passport wouldn’t be enough to keep him safe. He didn’t know what to do, so he went to his Rebbe for help. The Holy Rav Chaim Elezar Shapiro of Munkatch was one of the greatest Rebbes in Europe at the time. Not only was he a Tzaddik, but also a mohel. It is known that if the person who does the circumcision is very holy, the baby doesn’t feel any pain. It just feels natural to him, like G-d intended it to be. 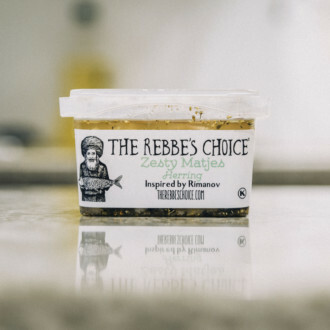 “I promise, Rebbe,” the chasid said eagerly. “I’ll never tell a soul!” So the Rebbe gave him the Munkatcher passport. Perhaps the wicked ones pain is also that Gods love surrounds the wicked as well, yet he cannot tap into it until he returns from his evil ways. “And God answered his [Yitzchak’s] prayer” (Genesis 25:21) Both Yitzchak and Rivkah prayed for children, yet, as Rashi points out, the pasuk only mentions “his” prayers being answered. Not hers. The Kotzker Rebbe asks the question; Were not both of their prayers answered? They both did end up having children, together. The Kotzker answers, Yiztchak and Rivkah both knew that Rivkah would have twins. One righteous son and one evil son. Yitzchak prayed that the righteous one should be 100% righteous, even if by result the evil one would be 100% evil. Rivkah’s prayer was that her evil son should not be entirely evil, he should have at least some good in him, even if it meant that the righteous son may not be completely, 100% righteous. This is what Rashi was commenting on, that the prayer of Rivkah focused on the evil, yet the prayer of Yitzchak focused on the righteous, on the truth, thus he was answered. “The fence of wisdom is silence.” – Rav Menachem Mendel of Kotzk. Silence is the fence of wisdom. We must find the balance that is true silence, not silence without speech, not silence without sound but the balance of fencing in the wisdom we have but not building a fence that keeps new wisdom out. If we don’t say anything we will fence out all the new wisdom and never gain knowledge. If we speak too much we open the gates and lose all sense of wisdom. Balance is the key to the gates of wisdom. Sometimes we have to swallow our pride but we should never swallow the key. This intensely flavorful herring begins with Canadian Pickled Herring. 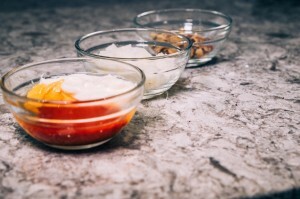 The kick of the Sriracha balances the sweetness and light sharpness of the honey mustard, producing a delicious kick with a hint of sweetness. The diced onions, add a savory taste to the already appetizing blend presented in this container. Container Size: 12oz. 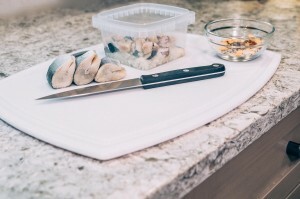 – about 20 tidbit pieces of herring per container. Ingredients: Pickled Herring, Onions, Mayonnaise, Sriracha, Mustard, Sugar, Spices. Allergy Information: Contains Fish. Contains Egg. Gluten free.